May is over already!? How did that happen? 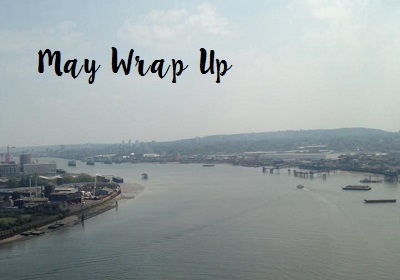 I've had quite an interesting month to say the least and I did a few things that really excited me! At the start of May I was in London for a few days seeing James and we decided to go on the Cable Cars over the Thames. As I am claustrophobic it was a challenge but it was something that I'd always wanted to do, so I was brave. I'm so glad I did it as it was amazing! The views were spectacular and I was in awe. The picture above is of one of my views whilst going across. It was beautiful. I also went to a gig this month! I went to see a Japanese band called Coldrain at The Borderline in London and it was brilliant! I came out a sweaty mess but it was amazing! Also met some really lovely people too! I had a week off at the end of May and spent it with James. We had a week of doing awesome things! He took me out for a lovely meal, we went bowling, went to the cinema to see Captain America Civil War (which was so good!) and caught up with some old friends which was great! 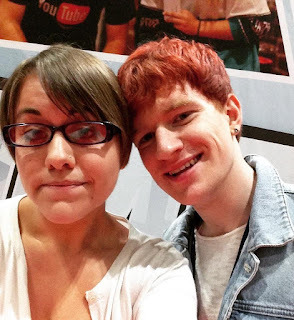 I also went to MCM Comic Con in London and it was amazing! I go every May and October and I never get bored of it! I love releasing my inner nerd. I didn't cosplay, sadly. However, I am planning to in October. Whilst I was there I managed to meet two of my favourite youtubers - Lukeisnotsexy and Doddleoddle. 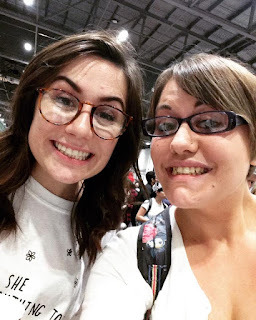 They were both so lovely and I did fangirl a tiny bit, but not so much as to scare them. I also treated myself to a few bits which is always nice. I haven't really got any plans for June at the moment, as I'm working throughout it. However, I am hoping to get through my June TBR list and start to enjoy the weather (that's if it does get better). Me and James are also going to be looking into going away at the end of July, so will hopefully be booking that. I'm just going to go with the flow in June and see what happens.